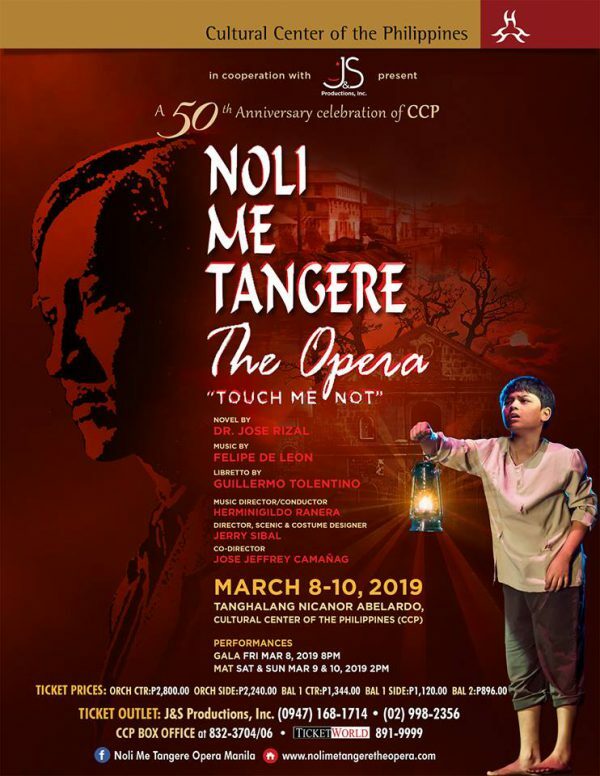 ‘Noli Me Tangere, The Opera’ is coming back for a limited engagement from March 8 to 10 at the CCP Main Theater. Co-produced by the Cultural Center of the Philippines (CCP) and J&S Productions Inc., and directed by Jerry Sibal (who also serves as set and costume designer), this particular staging first ran from January 28 to February 3, 2017 at the same venue. Apart from the casting, the upcoming 2019 production will also have changes in the sets, lighting, and some of the costumes. Cast members include Nerissa De Juan and Bianca Camille Lopez, who reprise their role as Maria Clara, Ivan Nery and Nohmer Nival as Crisostomo Ibarra, Allison Cervantes, Nicola Peralejo, and Bernadette Mamauag as Sisa, Nazer Salcedo, Greg De Leon, and Joseleo Lodgat as Elias, Nils Flores and Ronnie Abarquez (who also alternates as Kapitan Tiyago) as Padre Damaso, and Lawrence Roxas as Kapitan Tiyago. Noel Comia Jr. and Mari Yapjoco also reprise their role as Basilio, while Santino Juan Santiago reprises his role as Crispin. Also joining the cast are Nenen Espina (Doña Victorina), Oliver Pineda (Tenyente Guevarra), Anna Migallos (Sinang), Micah Galang (Andeng), Ma. Krissan Tan (Tiya Isabel), Timothy Racho (Alferez), Ruzzel Clemeno (Don Filipo), Tomas Virtucio Jr. (Albino), and Rare Columna (Victoria). Based on Rizal’s novel of the same name, ‘Noli Me Tangere, the Opera’ was written by National Artist for Music Felipe de Leon (music) and National Artist for Sculpture Guillermo Tolentino (book). Previous incarnations of the opera have been staged at the Far Eastern University (1957), the CCP (1987), and Resorts World Manila (2014). An opera in three acts, the production follows the story of Juan Crisostomo Ibarra, who returns to the Philippines after pursuing scholarly studies in Europe. He plans to open up a school and marry Maria Clara, his betrothed. However, parish priest Padre Damaso, the archenemy of the Ibarras, is out to hinder Crisostomo’s plans, which creates a dramatic storyline of forbidden love, betrayal, and revenge. J&S Productions Inc. was founded on May 15, 2014 by New York-based art enthusiasts and philanthropists Jerry Sibal and Edwin Josue. For tickets, call J&S Productions at 0947-1681714/ (02) 998-2356, or the CCP Box Office at 832-3704/06. Correction, January 26, 2019: This article originally mentioned that Mari Yapjoco will be playing the role of Crispin and left out Santino Juan Santiago. It also misspelled the name of actress Nicola Peralejo.